Last week, I traveled to Miami to discuss with urban scholars from around the world the dynamics of placemaking in the global city. This included a presentation on lessons from First Stop Portland about how cities learn. The audience feedback was resoundingly positive! 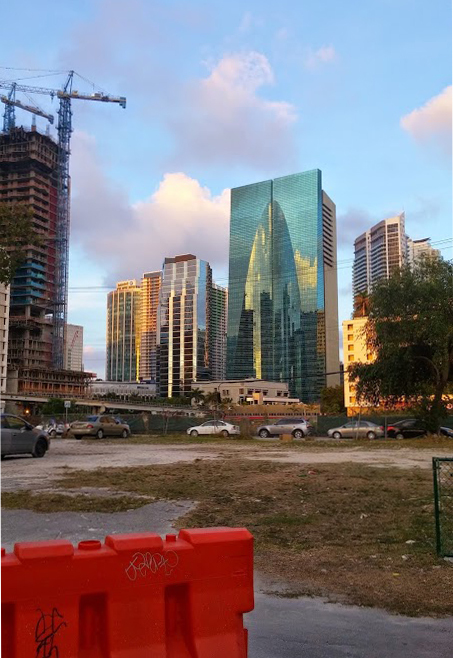 Throughout the week, I had a chance to explore Miami, a city remarkably different from Portland--culturally, geographically, and economically. What hit me first, apart from the tropical humidity, was the diversity—people of many colors and languages and social classes moving through a shared space in a manner that seemed choreographed, as if co-habitation had been negotiated over time such that it was no longer contested but almost embraced. Wandering the streets, the Miami I experienced was likewise diverse, composed of a wide variety of urban forms. There was the mirrored glass and steel high-rises of the powerhouse Financial District, “Gateway to the Americas,” where the typical American central business district ethos (and street population) reigns, including the mass exodus of automobiles from parking garages, followed by an eerily quiet street life after 5pm. In Little Havana, once home to the largest concentration of Cuban exiles in the world, cars hurl down the Calle Ocho (SW 8th St) toward downtown but pedestrians take time to meander: tourists and locals alike drink cafecito (Cuban coffee) and coco frio (coconut water) at open-air counters between stops at cigar, tamale, and pastry shops. Afternoons, elders play dominoes under shade in the park and Latin music pours from cafes at all hours of the day. Then there’s South Beach, a pastiche of tanned beach goers, pasty-skinned tourists, pastel architecture, and bright neon lights. Stroll down Lincoln Road and you'll find flea market peddlers and farm stands set up alongside designer boutiques and Starchitect-designed parking garages. 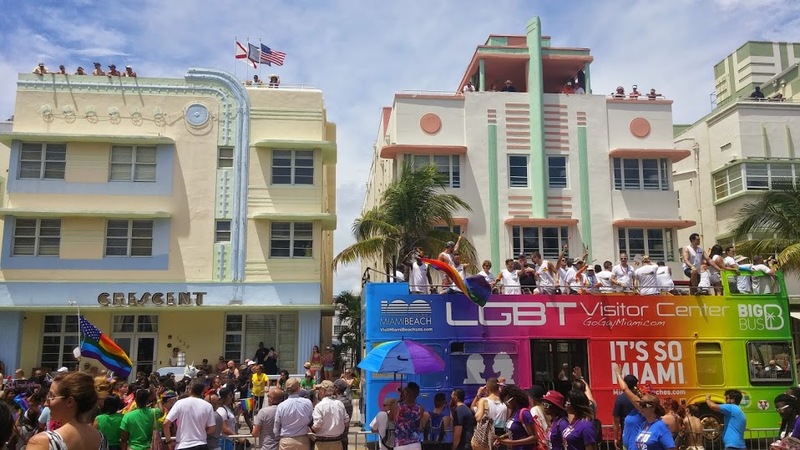 Serendipitously, during a Sunday stroll, I stumbled upon 130,000 people gathered for Miami Beach’s annual Gay Pride celebration, an event even more colorful than its Art Deco backdrop. It wasn’t until I arrived in the Wynwood Arts District, a small area north of downtown, that my Portland rader detected its first hipster vibe. First a suburban neighborhood, then a thriving garment manufacturing district, Wynwood was torn apart by urban renewal and highway building in the 1960s and 70s and ultimately ghettoized as the “Puerto Rican Barrio.” Today, this quickly gentrifying neighborhood of tony art galleries and restaurants sprinkled among warehouses is among the city’s hippest. 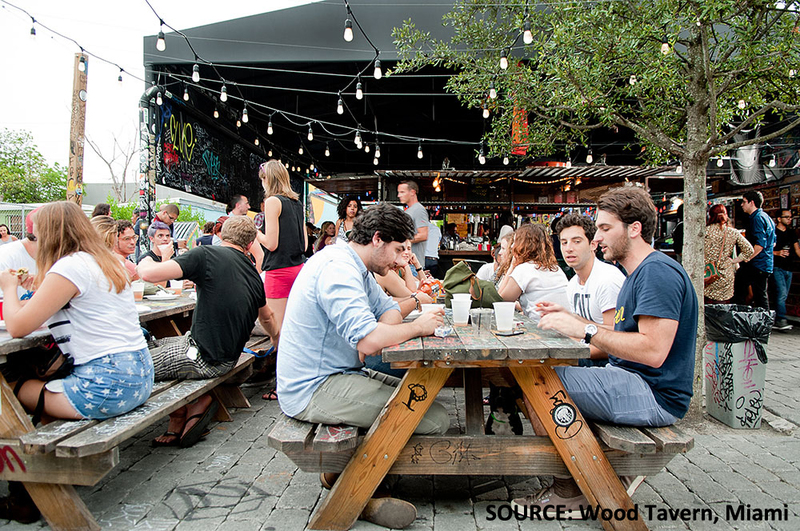 Eerily similar to Portland’s Alberta Street Arts District, Wynwood is a hotbed of activity for Miami's young creatives. Both districts declined through disinvestment and the dispersal of local minority populations only to be revitalized through local community development and city-led planning processes undertaken in a booming real estate market. The districts differ in their local articulations of creativity as it relates to urban space. In Wynwood, nearly every inch of exterior space is covered in a dizzying array of graffiti-like street art, which I'm told is constantly changing. It lends an edgy, authentic feel to the neighborhood despite intense development underway. 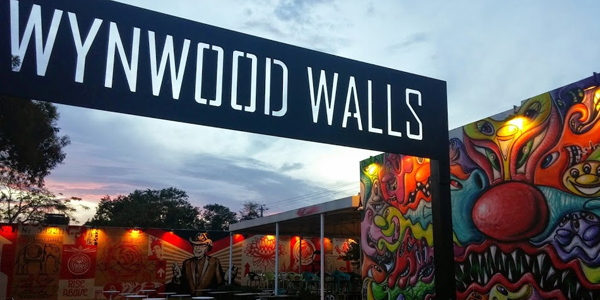 There also appeared to be many more walls and fences separating the public sphere from the private than we're accustomed to in Portland: in Wynwood, as elsewhere, Miami comes across as one giant gated community. I wish I'd had a "First Stop Miami" expert to tour me through the city so I could learn more about the forces shaping this sprawling metropolis. It's apparent that rapid growth, speculative investment, high migration rates, and transient populations are all driving rapid neighborhood change throughout the city. While Miami certainly has its work cut out for it, the city potentially offers lessons for Portland, especially with regard to the changing dynamics of a multi-ethnic, global city. 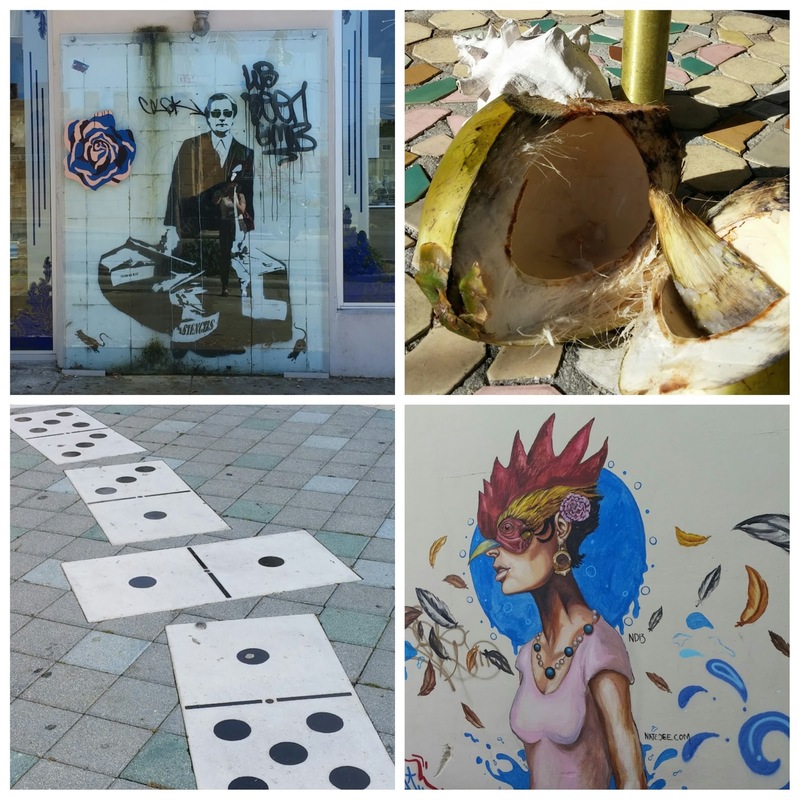 Below, a brief sampling of the street art in Wynwood. 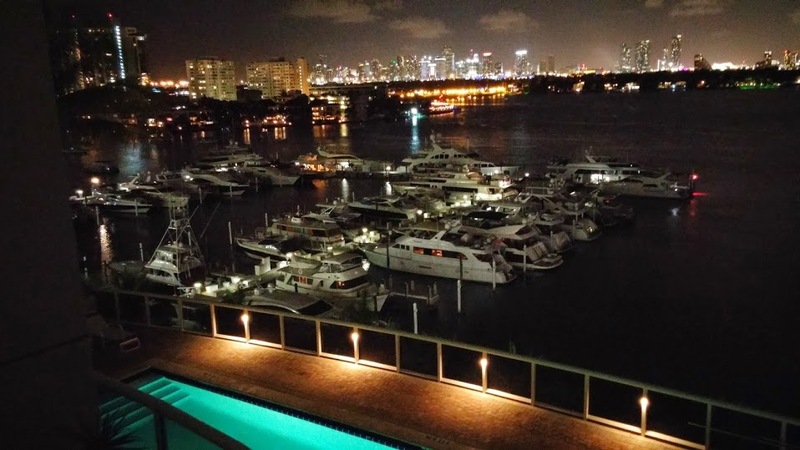 One critique, South Beach is not in Miami, it is in the nearby city of Miami Beach. There is already enough misinformation circulating about that. I wouldn't go to Eugene and tell people I visited Portland. Thanks for letting us know! I had no idea South Beach was it's own municipality. We struggle with that sharing the Portland Story because "Portland" refers sometimes to City of Portland proper but at other times to the Portland Metro Area and/or region.